Buffalo Summer made a welcome return to the capital for a headline show which made it a very Good Friday. So it was upstairs at The Garage to get down with some excellent blues and rock, and the crowd were delighted the boys were back in town. If Ross Connor hadn’t mentioned it, you would never have known the band only had 4 days in which to practise, as they were sounding polished from the outset. With catchy hooks from the start, a bluesy style to the songs and great sounding gravelly vocals, it was an enjoyable set. Having a heavy, thumping rhythm and an upbeat sound ‘Money Spider’ picked up the pace and the classic ‘Walking Blues’, a Robert Johnson cover had a heavier tone with the full band playing it. Playing one song on his own, Ross made it his own with the Eric Clapton cover ‘No One Knows When You’re Down And Out’ which was sung in a more bluesy style and brought with it a richer tone to the track. Ending on ‘Ain’t No Fool’ which was a foot stomper of a song, Ross Connor had impressed those there with a splendid set. Buck & Evans have been impressing a lot of people with their sound, which is a style of rock and blues with a touch of soul. With the powerful vocals of Sally Ann Evans, who has the ability to capture the attention of any audience, and the combination of the sublime guitars of Chris Buck, theirs was a set that impressed those there. ‘Going Home’ with its delicious bluesy guitars and vocals that were powerful over the heavier rhythm, and ‘Dreams To Remember’ both sounded immense in the intimate venue. In a contrast of styles, ‘Trail Of Tears’ with its delicate guitars and keyboards showed a softer side to the band and ‘Screaming’, which saw Sally away from the keyboards on this song, was a powerhouse of a tune with vocals that rang out around the room. ‘Ain’t No Moonlight’ had a slightly funky sound to it and had many people there dancing along. With an excellent set from them, Buck & Evans definitely impress live. It was almost six months since Buffalo Summer had last been in London, but it was worth the wait for them cross the Severn as this is band that are just brilliant live. After two great sets before them, things were turned up a notch and it was time to indulge in some heavy guitar riffs, a thumping bass and of course those lush vocals. ‘A Horse Called Freedom’ set the entire tone of their performance, with its massive chorus, as bassist Darren pointed his bass to the ceiling from the outset. Picking up the pace with ‘Ain’t No Other’ with its thumping rhythm, singer Andrew Hunt was on excellent form and the band were clearly enjoying being back. With a number of new songs, ‘Bird On A Wire’ gave an excellent taster of how the much anticipated album from them is going to sound and ‘Make You Mine’, with tambourine held aloft at times during the song, went down well with the crowd. With the drums pounding the venue and those epic guitar riffs that are incredibly infectious, favourites ‘Truth From Fable’ and the not so much played ‘March Of The Buffalo’ were songs that sound immense live. Always entertaining to watch, ‘Little Charles’ and High As Pines’ which again were new songs still had the crowd dancing along to them, as any song they play always has an addictive groove to it. ‘Heartbreakin’ which they played on their tour last year, had the ability to impress with its crunchy guitars and ‘Rolls On Through’ with its catchy chorus sounded brilliant. With Andrew twirling around the stage and both the band and crowd moving along in unison to every song, this was what live music should be all about, and there ain’t no other like Buffalo Summer to give you that feel good factor when you watch them play. 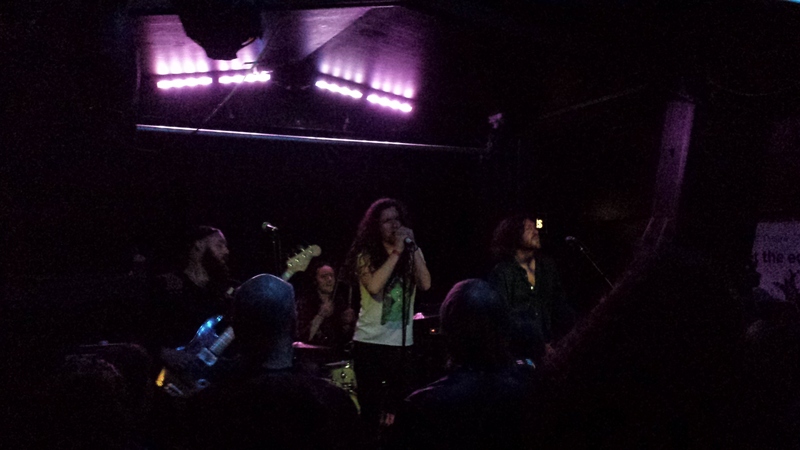 ‘Down To The River’ with its anthemic chorus had the crowd singing and clapping along to it, and closing their set with ‘Into Your Head’, once again Buffalo Summer had put on an electrifying show and as ever, were amazing live.